When I had the opportunity to play on Mark Knopfler’s sunburst Schecter Strat some weeks ago, I could also try out some other great guitars over there. Here is a video of a 1961 Fender Stratocaster in all original sonic blue that really impressed me. 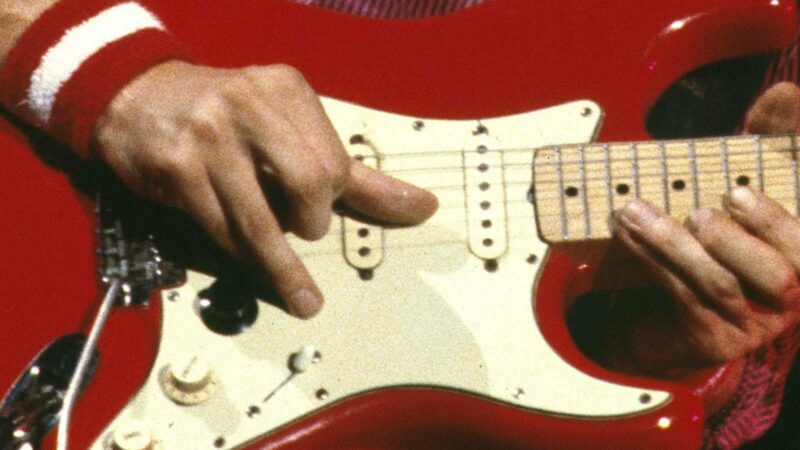 Some slab board Stratocasters from the very early sixties can have a rather dark or even muddy sound, that’s why some players prefer Strats after summer 1962 when the transition from the fat slab board of Brazilian rosewood to the thinner curved fingerboard was. Not so this 1961 Strat, it rang like a bell and sang like a bird (IMHO)! But listen and decide for yourself. The guitar was played through an Ernie Ball volume pedal into a Tone King Metropolitan amp. The strings on the guitar were 09-42. Recorded with the mic of the camera, that’s why you hear that much compression (almost all cameras have a built in compressor to avoid distortion). Sounds great. I always debate whether I prefer one piece maple necks or rosewood boards. I tend to feel the sound difference is negligible compared to which one you prefer the feel of. But, this guitar sounded clear with some warmth and looks to be in great shape. Beautiful!